Details such as the moving sensation of a cable car, the sound of the wind on the mountain, or touching the side of a camel will hopefully help tell the story of the way these girls experience their environment, and represent their potential to appreciate experiences that we might otherwise assume are mostly dependent on sight. These trips are one of the many ways in which Ms. Lydia helps expand the limited world the girls often live in. 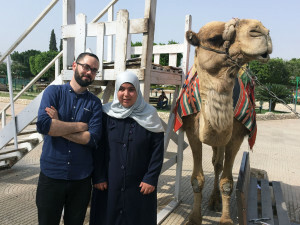 Looking forward to the next trip, possibly either a boat ride in Jaffa or a petting zoo in Qalqilya. DC update – 2015.02.26 from Not By Sight Film on Vimeo. Behind the scenes sunrise time-lapse!